Lately I’ve been trying to diet alongside my lovely wife. It’s definitely been adventurous and I’ve noticed that good diet makes me feel better. I guess it’s correct, you are what you eat. We decided to follow a diet of no carbs. It is a very difficult diet because every meal we’ve had previously had carbs. No bread, rice, quinoa, potatoes. Pretty much nothing yummy. It’s very difficult to be on this diet because I have to remember that I’m on it, and remember what I’m not allowed to eat. We also decided to not eat sugar. That was a bit less challenging for me as I rarely have a sweet tooth. I tend not to have desert after dinner, so only when it’s given to me, I’ll munch. What can I say, I don’t like to ruin a good meal with desert. This morning I took a flight from Toronto to Ottawa. It’s a short flight, so usually they give you a snack and a small drink. My wife informed me that morning flights get a cookie. I was very disappointed because as you probably gathered I like pretzels. I tried many pretzels, and I seriously can’t find ones like these anywhere in the stores. Wow, you diet so much and someone wiggles something you love in front of your nose, and you forget all about that diet. 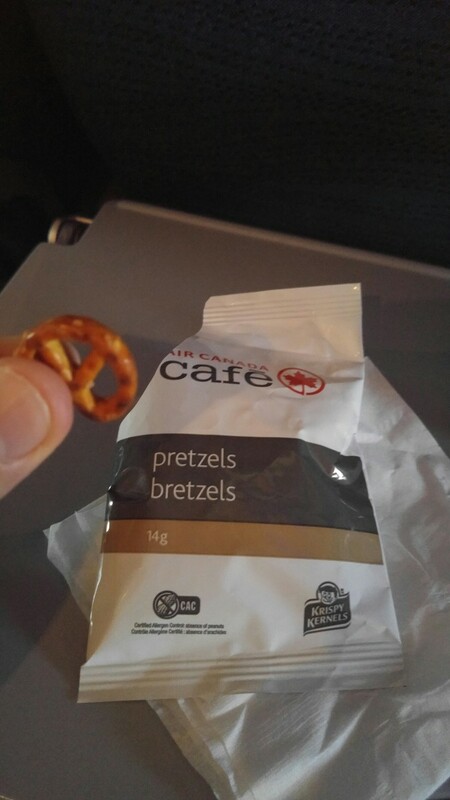 I love Air Canada pretzels, and am always happy to be on short flights that serve them. I just wish there was more! From all the pretzels I’ve had, these are best. I’ve got no idea what they put in them, or whether they’re so fresh, but they taste amazing. This short flight was definitely worth breaking my diet habits today. Thanks for reading, and next time you’re on a short Air Canada flight, enjoy the treat, hopefully you get their amazing pretzels.